Hope you grabbed a Pumpkin Spice latte because it’s time for our second installment of Booktober! For those of you just tuning in, Booktober is a month long book series that aims at providing our readers with spooky reads, chilling author interviews and awesome giveaways. With Halloween and Day of the Dead just a couple weeks away, it’s time to start getting into the spirit. My second installment highlights another Halloween themed read geared towards our younger readers. The Peculiar Haunting of Thelma Bee by Erin Petti is about a young girl named Thelma Bee who loves science, constant questions the world around her and conducts experiments. With a mother who is always traveling, Thelma spends her days with her dad helping him out at his antique shop. One day, they receive a very interesting box that they soon find out is cursed. This sets Thelma and her friends off on an epic adventure filled with monsters and ghosts. But there’s a family secret that may help her along the way and it’s one she’ll never forget. Warning: This book review has spooky spoilers. The Peculiar Haunting of Thelma Bee is quirky, suspenseful and adorable. Though this story is geared towards younger readers, there are components in the story that’ll captivate a wider audience. The story has many twists and turns that made it quite a page turner. Thelma Bee’s world toggles between logic and reasoning with imagination and magic. She has quite a fascination with science and is always found conducting experiments and questioning her reasoning. She’s sophisticated for her young age of eleven. Though she’s young, I found myself relating to her. Quirky, smart and speaks her mind. Being a young girl, Thelma Bee reveals a hidden strength that she possessed. Not afraid to do things that push her boundaries, and rationalizing her actions between right and wrong, black and white. But it wasn’t just her personality that stole my heart, it was her strong bond and unconditional love she had for her parents, particularly her father. Since her mother travels a lot, her father was naturally more present in her life. From tucking her into bed to supporting her with her schoolwork, he was always there. Though he didn’t have much of a presence in the story, the amount of time he was in it you can definitely sense their strong bond and how they possessed similar quirky personalities. Besides characterization and character relationships, the paranormal and magical components are what truly got my attention. There’s something about ghost stories that provide the perfect chills, especially around this time of the year. The Peculiar Haunting of Thelma Bee had classic elements of the scary movies and books I enjoyed growing up. There was a particular scene where Thelma was getting ready for bed where she had her first encounter with a ghost. In the bathroom washing up, she looked up from the sink into the bathroom mirror and saw that a ghost was looking right at her. Little did she know that wasn’t going to be the only magical or haunting thing she was going to encounter. Erin Petti has a way of adding layers upon layers into her story that allows readers to deep dive into this imaginative world she created. A component of the story that she cleverly put together focused on Thelma and how she wasn’t an ordinary young girl. Thelma had magical powers that she couldn’t quite explain. She possessed an inner sense of warmth and fire that erupted inside of her. But much like Rey when she discovered that she possessed the force in Star Wars: The Force Awakens, Thelma didn’t know she had such power or knew how to control it. Though this story was entertaining, there was areas in the plot and characterization that were a little underdeveloped. There were questions that were still up in the air such as what Thelma’s power was exactly because the explanation felt a little muddled and confusing. Additionally, the family’s backstory and history was a little confusing to follow. I didn’t have much of a reaction when I found out that Thelma had other family members who possessed the same magical traits that she did. A deeper and more detailed explanation would’ve drove those points home. After reading this book, it surprisingly gave me more spooks and chills than initially anticipated. 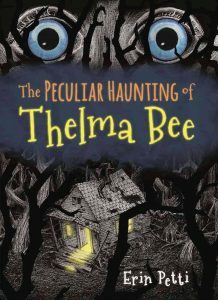 I highly recommend The Peculiar Haunting of Thelma Bee for readers, both young and the young at heart, who are looking for a quick spooky read that’ll get them in the Halloween spirit. Erin Petti really puts forth a solid effort as she brings to life a world that has a number of different magical components alongside ghosts, monsters and things that go bump in the night. Previous ArticleTV Review: Frequency 1x02 "Signal and Noise"
Next ArticleArrow 5x02 "The Recruits"